My kidsare both sweet and sour on a regular basis… as are all of us. Depends on the minute. Depends on the day. Every once in a happy while, however, one of my children surprises me with an unexpectedly sweet moment that becomes a heart treasure. “What do you love, Hunter?” I whispered. Lying beside him in the dark room, I could scarcely process the vastness of his statement. It was the simplest of thoughts, delightfully honest, yet one of the most profound and insightful statements I’d ever heard come from his lips – from his heart. He had a deep longing to be loved. He knew he was loved. His love tank was being re-filled as I tucked him in. His greatest need is love. Like Hunter, my greatest longing and need is also to be loved… to feel safe, adored, and content in love. I don’t know where this devotion finds you today, but I sense God nudging me to tell you that He loves you. Completely. Perfectly. Eternally. (Yes, I’m talking to you!) He knows your name, He knows your heart, He knows your circumstances, and He hears your prayers. He loves you and desires for you to rest in His love. God’s Word says so. God’s love is not based on performance or beauty. It’s not based on your position or abilities. Many times we mistakenly think that if we could just do this or that better – that God would love us more. That if we just hadn’t done this or that – God could love us more. The truth is this: God will never love you more or less…no matter what. His love is complete and you are the object of His heart’s affection. No matter what you’ve believed in the past, choose by faith to believe this now: you are valued, priceless, and adored by God. “Take in with all Christians the extravagant dimensions of Christ’s love. Reach out and experience the breadth! Test its length! Plumb the depths! Rise to the heights! Live full lives, full in the fullness of God”(Ephesians 3:18–19, MSG). Let those words sink in. Savor the special sweetness of God’s love for you today. Take it very personally. Linger long on thoughts of His affection for you. Let them find and fill your heart in wounded places. When you embrace the deep love of Christ as a personal reality, you will gain traction for powerful, meaningful living that begins with forgiveness and continues on in truth and grace. Go in His love today. Be assured of it. Share it. Be changed by it. Love Him back. Change others with it. Dear Lord, Thank You for loving me beyond what I deserve and understand. In a world of uncertainty, I’m so grateful to know that Your love never changes, never waivers, and never fails. I love You, Lord. Please move my heart to love You even more today. God loves you and takes pleasure when you go to Him in prayer. Why? Because you are His – made by Him for Him – treasured by and restored to His heart through Jesus Christ. Allow Him to quiet you with His love today. Spend a few moments in prayer right now. Thank Him for His love. Worship at His feet. Be still before Him. GO DEEPER: Click here and reflect on God’s love a few minutes more as you listen to a song I co-wrote called Unbroken. Why do women rarely pause to dream big dreams, think big thoughts, or expect great things from God? This is a passionate call to follow God with great expectation for the impact, the challenge, and the blessing that comes from dreaming big and believing that God keeps his promises. 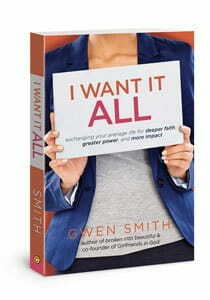 Join me in a FREE seven-day journey into a bigger, deeper and more significant relationship with God taken from my upcoming book I Want it All.